Defensive shooting calls into a play a much different skill set than those utilized for precision shooting. Will becoming a ‘better’ shooter help in a self-defense situation? Seeking artificially high levels of precision, beyond what the target requires, during an incident is counterproductive to efficient defensive shooting. Working to simply become a better shooter, in other words spending time learning to deliver artificially high levels of precision, may not be the best way to train to survive violent encounters. There isn’t a single level of precision appropriate to all encounters. Your need for accuracy (actually hitting the target area) doesn’t change, but the recognized precision (which tells you how carefully you need to shoot) certainly does. Your highest efficiency in training is attained by focusing your efforts on being able to deliver appropriate levels of precision – no more, no less – on demand, as quickly as you can, without cognitive thought as to the application of your skill. The recognition of the precision needed should trigger a recall of the skills necessary to achieve it. 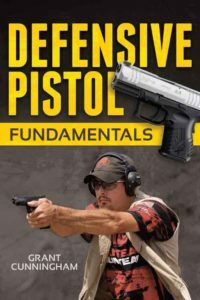 Editor’s Note: This article is an excerpt of Grant Cunningham’s Defensive Pistol Fundamentals. Allowing yourself to shoot the same target over and over, focusing only on speed, is not practicing realistically. You have nothing to recognize (or, more precisely, nothing to practice recognizing) because the precision needed has been statically and arbitrarily predetermined. Your drills become a choreographed and overly mechanical test of muscle control, and you end up focusing on the anticipation of the shot as opposed to the recognition of the need to shoot. In order to build the recognition and associative recall ability that makes for expertise, you must reduce anticipation by including options in your drills. Those options must be presented randomly, forcing the you to recognize the precision needed and then recall the necessary skills to make accurate shots inside of that area. It’s the association of the recognition and the recalled skill that forms the links necessary for this highly efficient decision making to happen. That can’t occur unless for any given drill there is more than one option, and it’s presented randomly. Any attempt to define a “good defensive shooting group,” regardless of what the definition may be, dooms the process to failure because there is no recognition for you to have. Competitive action shooting is a great way to tune your marksmanship in all sorts of unorthodox ed positions. I agree with you that shooting at a pie plate then placing the gun on a bench does very little in defensive situations. In fact most people will never know how they will react until they are in that situation for real. Some of the better training academy’s are huge help in creating that atmosphere. I have a few friends in law enforcement who where in actual shootings, one that ended it fatally stopping the attacker. This particular officer got involved in IDPA type shooting a few years prior to this to sharpen his skill lever with his weapon and all his duty gear. He was about average in the dept on his shooting ability, but after the first year went right to the top and became there firearms instructor. He basically changed all his gear, because it did not work to well in unorthodox situations when movement and speed where involved. After the shoot, my first question to him was how he felt immediately after: did he wet himself, was he able to talk, could he think straight, cry, what was his reaction? He told me he felt nothing different then before the shoot, he was able to think out all his moves from the time he realized he must use deadly force to stop this guy, his partner was a different story though. He got off 5 rounds, all hits and 3 fatal before his partner even got his gun out of the holster. His partner got off one round that went into the candy rack, the distance was about 10 feet. He told me if it was not for getting into competitive shooting, shooting matches with all them people behind him watching, he feels he would have not been in that frame of mind. I know there are pros and cons in comparing the two, but any form of gun handling that requires you to use your carry or duty gear will help you if the need arrive. Most of us will be about half are skill level in a stressful situation, but not everyone. Gun handling skills that become second nature can be one less thing to worry about if that day should ever come, pray to God it does not.